This article needs to to be rewritten to too sloppy, needs to be rewritten by someone more informed. For the Wii game, see Samba de Amigo (Wii). (With Maracas) 200x €79.99 ? ? Samba de Amigo (サンバ DE アミーゴ) is a video game developed by Sonic Team. It was originally released in 1999 by Sega for the Sega NAOMI arcade platform, before seeing a port to the Sega Dreamcast a year later. 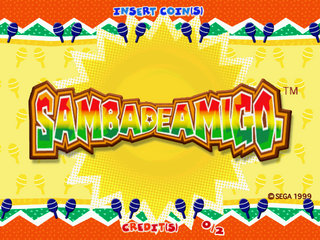 The Dreamcast version was designed to be used with the Samba de Amigo Maracas. A rhythm video game similar in theme to Dance Dance Revolution, Samba de Amigo is played with a pair of maracas. As a song plays, the player (guided by on-screen graphics) must shake the maracas at high, middle, or low heights with the beat of the music, or occasionally must strike poses with the maracas held in various positions. The player is represented on-screen by a grinning monkey with a square head and a sombrero, Samba. If the player does well, the scene around Samba (usually a concert or a dance) will attract more people and become more vividly animated; if the player does poorly, characters leave and eventually all that's left is the monkey alone, looking sad. In the primary game mode, each player has six spots arranged in a circle on the screen: two red meaning 'shake high,' two yellow meaning 'shake middle,' and two green meaning 'shake low.' Blue dots will appear in the center of this circle and move towards the spots; as soon as the blue dot touches a spot, the player must shake a maraca at that location. For example, if a blue dot touches the upper left spot, the player must shake either maraca above his left shoulder. Occasionally a long line of dots will flow into a spot and the word 'Shake' appears, telling the player to continue shaking his maraca rapidly there. Sometimes a stick-figure (named "Pose-kun") appears on the screen holding its maracas in a certain position; the player has a second or two to match the figure's pose for points. "La Bamba" Ritchie Valens 1958 This is the cover by Ritchie Valens from 1958. The earliest confirmed recording dates back to 1939, but as a Mexican folk song it is likely much older. "Macarena" Los del Río, Bayside Boys 1995-08-15 This is the more widely known English language version from 1995. The original Spanish version dates back to 1993. "Take on Me" Reel Big Fish 1998 This is a ska cover of A-ha's 1984 hit. The Dreamcast version of Samba de Amigo allowed users to connect to the internet and "download" songs from other Sega games. These are thought to already exist on the disc - it was more of a means of getting people to go online. "Can You Become Rent A Hero For Mankind's Sake?" Rent A Hero No.1 Samba de Amigo debuted on the Dreamcast about a month before Rent A Hero No.1, meaning this track could be heard by the public before the game could be played. Samba de Amigo has not seen any direct "sequels", but has had a number of updates over the years. The first being Samba de Amigo Ver. 2000, also on Sega NAOMI hardware and the Sega Dreamcast. A Wii version was released in 2008. Samba de Amigo was named Best Puzzle Game of 2000 by GameSpot. It also was nominated for the Excellence in Audio award and for a Game Spotlight Award in the 1st annual Game Developers Choice Awards. Dreamcast version adds a "party mode," with minigames such as Guacamole (pronounced and played much the same as "whack-a-mole"), Strike A Pose (consisting of a long sequence of poses to make), and 1-2-Samba! (where spots must be hit in sequence - the Japanese version's name for this minigame, "Ichi Ni San-ba," is a pun on counting to three in Japanese). The home version also has features which can be unlocked, such as sound effects and hidden songs. Hidden songs include themes from other Sega games such as Sonic Adventure and OutRun. For Dreamcast version, the Sega maracas controllers are red, and the rattle part can be unscrewed from the top of each for quieter play. Each maraca has a cord which is plugged into to a bar that lays in front of the player's feet. The bar is slightly more than two feet in length and has a sensor at each end, and each maraca has an infrared transmitter mounted on its cord; presumably this allows the system to triangulate the position of each maraca as the player holds it. The game can also be played with the standard Dreamcast controller, but this makes the game trivial to play. Main article: Samba de Amigo/Magazine articles.